Light and buttery shortbread cookies are laced with a hint of coffee flavor. Coffee Shortbread Cookies have a light coffee flavor that doesn’t overpower the delicate shortbread cookie. And #ChristmasCookies continues! Did you see the delicious recipes that were shared Monday and Tuesday? If not, you should go back and check them out. Actually, if you just follow #ChristmasCookies or #ChristmasCookiesWeek you can easily see the delicious treats. I’m not sure if y’all know this or not, but Nielsen-Massey sent a load of us some delicious extracts. They have the best extracts! Their vanilla bean paste is something I could eat with a spoon. I have an array of Nielsen-Massey extracts, too. I have lemon, orange, coffee, almond, and of course vanilla. They have such a great selection of extracts that are top quality. Nielsen-Massey only puts the best ingredients in their extracts and it shows in the quality of the baked goods or beverages I put their extracts in on my blog. I used Nielsen-Massey almond extract in a recipe I’ll be sharing later this week. It’s a version of a family favorite recipe that we used to make every year. You’ll want to read that post. I talk about my favorite memory baking cookies with my mother. It’s a little window into how I became a kitchen hoor. I was completely excited to hear the Nielsen-Massey was sponsoring this event again this year. I didn’t know what extract I was going to receive but was planned either way. Was it going to be a citrus extract? Maybe a peppermint extract? Or even rose water? I was excited to work with anything they sent me. So, the box arrived and I immediately opened it. Of course, Christmas cookie week was a long way away at that point and I couldn’t remember if it was the cookie week or another event. Then my crappy memory decided to work and I remember it was for this event. I tore into the box like a kid at Christmas. I pulled out recipe cards for peppermint cookies and a bottle of Nielsen-Massey coffee extract. Hmm…That’s sort of strange. Peppermint cookie cards and coffee extract? Hey! Whatever. It’s Nielsen-Massey coffee extract! Oh the things I can do with that little bottle of amazing goodness!! Coffee cookies, coffee cake, coffee ice cream, coffee everything!! It’s a good thing we like coffee. I knew I wanted to do either a butter cookie or a shortbread cookie this year. That’s when it hit me! 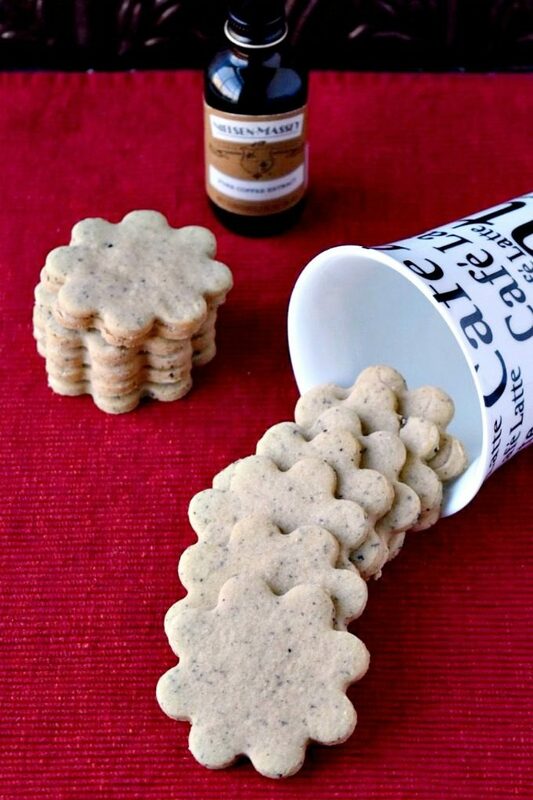 I need to make a coffee shortbread cookie. The delicate shortbread cookie would go perfect well with the light flavor of the Nielsen-Massey coffee extract. It was a match made in heaven. Now, I haven’t made a rolled out cookie in a long time. Thankfully, I have all the necessary tools to do this otherwise I’d be screwed. There’s no other way to put it. That’s one of many reasons why I’m a kitchen; I have a ton of gadgets. I’d rather have a springform pan than a pair of Michael Kors shoes or a handbag. I’d love to have more gadgets and I’m getting ready to order another one for later in the year. Any recommendations for a stove top smoker? Just throwing that out there. It has nothing to do with this post but wanted to see if you had any experience with them. So, I guess I should probably describe these coffee shortbread cookies. They’re light. Oh so feathery light. They’re not heavy with butter or sugar. These cookies are not overly sweet either. My coffee shortbread cookies are the perfect balance of delicate crunch, sweet, butter, and coffee flavor. Just a touch. Then there’s a few grounds thrown in there for texture and additional flavor. Of course you could omit the grounds if you’d like. Some people don’t like to chew their coffee. And that’s okay. If you had finely ground coffee that would be even better. Not so sure about espresso powder though. That might kick the coffee flavor into high gear. You don’t want to overpower the flavor of the Nielsen-Massey coffee extract. Now, since there’s a giveaway with this post, I want y’all to do yourself and favor and head to the Nielsen-Massey website to see all their delicious products. Then, be sure to follow them on Facebook, Twitter, Instagram, YouTube, and Pinterest to see all the delicious recipes and ideas they share for using their products. Cream the butter and powdered sugar together until light and fluffy. Stir in the vanilla extract, coffee extract, salt, and coffee grounds (if using). Slowly add the flour a little at a time until the dough is no longer sticky and comes together. Stir in the salt and coffee grounds. Roll the dough to 3/8” thickness and cut using your favorite shapes. Place on a baking sheet lined with a silpat mat or parchment paper. Bake at 350 for 12 – 15 minutes or until lightly golden around the edges. Allow to cool in the pan for 5 minutes before moving to a wire rack to cool completely. Store in an airtight container for up to one week, if they last that one. Nielsen-Massey provided products for us to use in our recipes, however, all opinions are our own. This post may contain affiliate links which means a portion of the sales made through these links goes to help keeping A Kitchen Hoor’s Adventures in the kitchen cooking up a storm. If I dont have coffee extract can i substitute with more coffee grounds? Please give me any suggestions! I would love to try this recipe! Thankyou! I would try super concentrated instant coffee. While it’s not so great for drinking, it’s pretty good in baked goods. Coffee and cookie in every bite. Genius! Thanks! That’s what I was thinking! Yum! I have a bottle of that extract on the way to my house, and it’s definitely being used to make these cookies! I can’t wait to try them. Spritz cookies made with my cookie press. That’s one thing I don’t have. A cookie press! I should add that to my wishlist. I like peanut butter cookies. Me, too! They’re one of my favorites. I love the speckled look the coffee gives to the cookies. I’m sure they’re delicious with coffee! Can’t wait to try them. I had a hard time not eating the whole batch. They’re were perfectly delicious with that extract. These cookies sound delicious. I have not used a stovetop smoker but am interested to see what you learn about them. I’m excited, but have to wait for my next pot of Mediavine to come in. They’re not cheap. Unless I can be convinced to find one on Amazon that gets a high rating that is not expensive. I’ll keep you posted.